In New Jersey, they don’t ask where you’re from. They ask “What Exit?” Saturday, the UB Bulls trip to Garden State Parkway exit 127 could be an on-ramp to national recognition as one of the emerging stories in college football. The game against Rutgers is the Bulls only Power Five opponent. It is a game against a Big 10 team. It’s a game in the New York City area, just 40 miles from Times Square. When fans outside of WNY start to examine the Bulls season, a game against a big-time school will the first one they look at. This is a chance for the Bulls to show the college football world that they are for real. It may not be a Top 25 team or a Big 10 powerhouse, but it’s the highest level opponent on their schedule. “I think there’s excitement. We’re coming in with a chip on our shoulder. We’re on the Big 10 Network. Playing a big team. We’re gonna go out and do what we do,” says wide receiver K.J. Osborn. Bull Session Trivia: While Rutgers doesn’t have the program history of a Michigan or Notre Dame, it does have a claim to college football history. The first ever college football game was played on the Rutgers campus in 1869. Who was Scarlet Knights opponent in that game? It may have been Tyree Jackson’s best game. For now. T3 was 21/26 against Eastern Michigan. He started 9/9. Three of the five incompletions were deep balls. He moved in the pocket, avoided the rush, and connected with seven different receivers. There seems to be a calmness about Jackson that wasn’t always apparent last year. He knows he has great weapons, and he knows he can find any one of them at any time. Tyree is now leading the MAC in passing, and up to 21st in the NCAA in passing yards…With three more TD passes, Jackson has now thrown 12 in three games. He had 12 all of last year in 8 games. Those 12 TD passes are tied for second in the country, and he’s now moved up to 5th in UB career history. 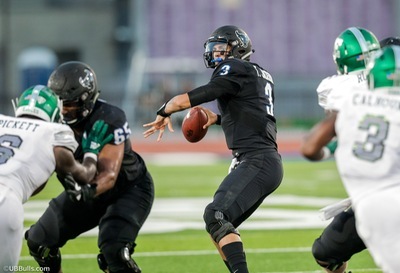 He’s thrown 21 TD in his last 5 games…I don’t envy any defensive coordinator on UB’s schedule. Who do you cover? Who do you double team? K.J. Osborn burned an EMU defense that was focused on Anthony Johnson. Osborn’s 188 yards were the 4th most in a Bulls FBS game. Osborn’s 5 TD catches this year lead the MAC and are 3rd in the NCAA…I didn’t realize until seeing the replay that Johnson’s first quarter 45-yard catch was basically a one-handed grab, as A.J. used his other hand to hold off the cornerback…The Bulls offensive line has still not allowed a sack, one of three teams in the country to do that. Right tackle Kayode Awosika did a nice job on All-MAC defensive end Maxx Crosby, holding him to just one tackle…Lance Leipold was telling the truth when he said the running back position would be a committee approach. Emmanuel Reed started and had 15 carries. Kevin Marks had 14 carries. At a crucial point in the fourth quarter, freshman Jaret Patterson had 9 rushes… The Bulls offense has scored 30 points or more in 6 straight games, the fifth longest streak in the country. They have also gone for it on 4th down 11 times, the third most in the country…Rutgers has a very good defense, even if their stats don’t reflect it. Bulls coaches talked all offseason about the talent on the Scarlet Knights unit. It starts with a very athletic linebacker unit. Trevor Morris leads the team in tackles, and ranks 4th in the Big 10. Both he and middle linebacker Deonte Roberts had over 100 tackles last year…The Rutgers secondary is missing their best player. Cornerback Bless Austin is out with a knee injury. He would have likely been matched up against Johnson. Fellow cornerback Isaiah Wharton is a three-year starter and he may get that job…Safeties Saquan Hampton and Damon Hayes are very good…Last week against Kansas, the Rutgers defense allowed 400 yards rushing and over eight yards per carry. Bullet Points: 52. That’s how many kicks the Rutgers special teams has blocked the last 10 seasons. It’s the most of any program in the country. That includes three blocks this season. That total adds up to 23 punts, 23 field goals and 6 extra points. The team UB faced two weeks ago, Temple, is third on this list with 36, including the blocked punt against the Bulls. It has been so much fun watching the development of Chuck Harris into a dominant defensive player. That peaked Saturday with 2.5 sacks, 8 tackles and forced fumble against EMU. Chuck now leads the MAC in sacks and ranks 10th in the NCAA…A week after Cam Lewis won MAC East Defensive Player of the Week wearing Solomon Jackson’s #41, Harris won the same award wearing the same number. When asked about the power of #41, Chuck called it “legendary”…This week, defensive tackle Justin Brandon will wear Superman’s Cape. Let’s see if he can make it three in a row for #41…Fellow DT Chibueze Onwuka had 1.5 sacks against the Eagles, and his quickness has been a problem for guards and centers trying to block him…Khalil Hodge passed the 300 career tackle mark, and he did it in just 27 games. That’s the fastest to 300 by any Bulls player ever…Through three games, the Bulls have forced 8 turnovers. They had 14 takeaways all of last year. The UB defense is 8th in the country in forced turnovers…With 9 sacks in three games (6 on Saturday), the unit also ranks in the NCAA’s top 25…Rutgers offense has struggled as freshman QB Artur Sitkowski has learned on the job. They have just one passing touchdown, and rank last in the Big 10 in eight offensive categories…Sitkowski has been intercepted 7 times, with three of them being returned for touchdowns…His ineffectiveness means there’s a chance that backup QB Gio Rescigno could play. The senior started in Rutgers three Big 10 wins last season…The Knights best offensive weapon is running back Raheem Blackshear. He leads the team in rushing and receiving. Leipold calls him “the best running back we’ll face this season”…Backup running back is Boston College transfer Jonathan Hilliman. He started and scored against the Bulls when they played the Eagles in 2016…Mostly due to the QB play, Rutgers doesn’t have a wide receiver with more than 8 catches…Tight end Jerome Washington is an NFL prospect, and was the team’s leader in catches and yards in 2017. Through three games, the Bulls have nine sacks. They had 19 all of last season. Eight of those sacks have come from the defensive line. It is the most improved unit on the team. There’s a reason for that. In the offseason, the NCAA allowed all college teams to add a 10th fulltime assistant coach. Leipold chose to make Roc Bellantoni the defensive ends coach, and moved the focus of Tim Edwards to the defensive tackles. The Coach says that’s the biggest reason for the improvement. “It has allowed both groups to get better. More repetitions on practice, more time spent on technique work. Coach Bellantoni has now worked more on pass rush. We’re more athletic on the defensive line,” says Leipold. The Bulls have regularly played five defensive lineman. Six defensive tackles are in the rotation. Harris has emerged as a dominant player. DT Onwuka is second on the team in sacks. Young players like Malcolm Koonce, Ledarius Mack and Taylor Riggins all have sacks. Tackles Eddie Wilson and DeShondrick Foxworth are helping to stuff the run. Bull Session Trivia Answer: Rutgers played New Jersey neighbor Princeton in the first ever college football game. In front of 100 spectators, the 25 Knights players beat the 25 Tigers players 6-4.